Creating On Account Sales – How can we help? On Account sales are sales are used to track product purchases that the customer intends to pay off at a later date. Check with the store manager to make sure your store offers On Account sales to every customer, or if approval is required. Each account sale is a separate invoice the customer will need to pay. If you'd like to add a sale to an existing invoice, you'll need to find and open this account sale again. Do not do this if your store uses the Xero integration. Ensure the customer is added to the sale. Issue the customer a receipt. 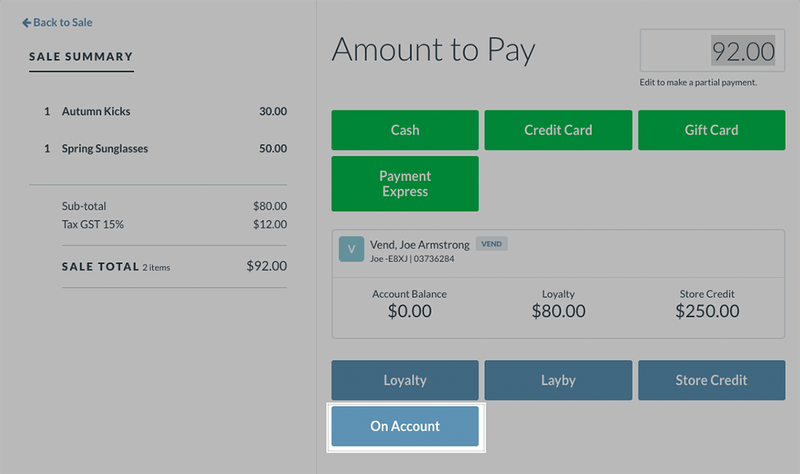 Tip: You can take a regular payment before placing the item On Account. The sale will be shifted to On Account status, and the customer will have a balance-owing recorded against their name. Each time that customer is added to a sale, you will be able to see any outstanding balance on their account. Once the balance reaches 0, the sale will be closed. Xero customers: On Account sales will create an accounts receivable invoice in Xero. You can read more about On Account sales and Xero here. 1. To open an On Account sale, tap the Menu button on the top left-hand side of the screen. 2. Click on Sales History. 3. Find the On Account sale and click on it. 4. Choose the Open Sale button. The sale will then open on your Sell Screen.